Cappon Magro: Cappon Magro or capòn magro is an elaborate and rich Genoese salad of seafood and vegetables over hard tack arranged into a decorative pyramid and dressed with a rich sauce.Cappon magro means ‘fast-day capon’. Since the dish contains no meat, it is suitable for traditional Catholic fast days including Christmas Eve. 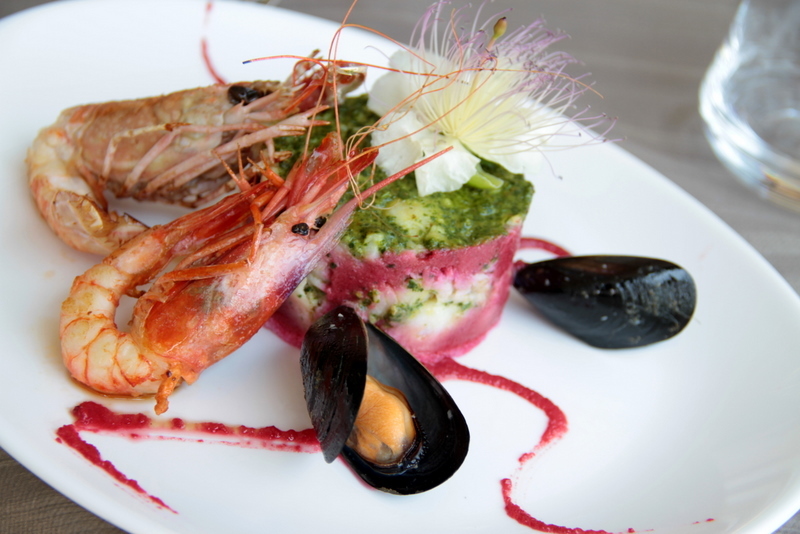 Each layer of Cappon Magro may consist of one or many vegetables, fishes, or seafood. All recipes include boiled white fish, a lobster, green beans, celery, carrots, beets, and potatoes.Other seafood and vegetables may also be included. Each ingredient is boiled separately, cut up, and seasoned with oil and vinegar. Fill a bowl half with water and the other half with vinegar. Add the bread roll without its crust to the water-vinegar mixture. Let the bread roll soak in the water-vinegar mixture. Chop half the anchovy fillets, 1 clove of garlic, yolks of 2 hard-boiled eggs, capers and parsley. Remove the bread from the bowl. Squeeze out the excess water from the bread. Combine bread with the chopped mixture. Pass everything through a fine sieve, to make a bread mixture paste. Slowly add 1 cup of olive oil to the bread mixture paste, whisking as you go. Season the sauce with salt. The sauce for the Cappon Magro is ready. Boil the cauliflower, French beans, celery, and carrotsin salted water. Trim the artichokes and cut them in half. Separately boil the potatoes, black salsify, beetroot and artichokes. Clean the fish and boil it. Separately, boil the lobster and the langoustines. Cut the fish into medium sized pieces. Shell and slice up the lobster and the langoustines. Toss the fish pieces, lobster medallions and langoustineswith olive oil, lemon juice and salt. On the serving plate, arrange the croutons, rubbed with garlic. Drizzle a little acidulated water and olive oil on top of the arranged croutons. Arrange in alternate layers the vegetables, fish, half medallions of lobster with half langoustines. Drizzle a little sauce on top. Finish off with more lobster, langoustines, anchovies, remaining 2 hard-boiled eggs and mushrooms. Open and detached the oysters from their shell. Pour over the remaining sauce and decorate the edges of the plate with the oysters. Cappon Magro is ready to be served.